In this last article on page mapping, we are looking at the dates and locations of Stark‘s sojourn in Europe, matching the ones inscribed in his sketchbooks to the events and locations of his military unit. In many of his sketchbooks, Stark wrote the name of the town or village that he was sketching. Occasionally, he would also include the date. These notations give the modern viewer a real sense of the time Stark spent in France and Belgium, and were a great help in the re-sequencing of the detached leaves. We were able to verify dates and locations by looking at the war diaries of the 1st Battalion of the Canadian Railway Troop. War diaries are the daily accounts of First World War units. 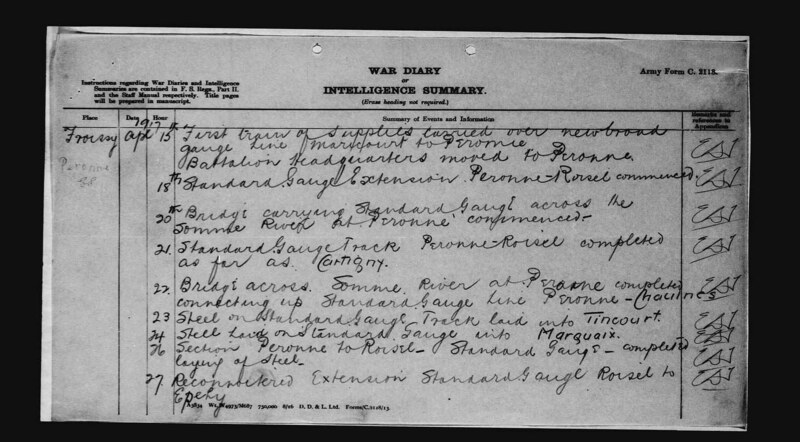 Entry in the war diary of the 1st Battalion of the Canadian Railway Troop showing the entry for the captured German naval gun on August 14, 1918. A view of Pérrone dated April 1917 found in sketchbook 7 (MIKAN 3028908). 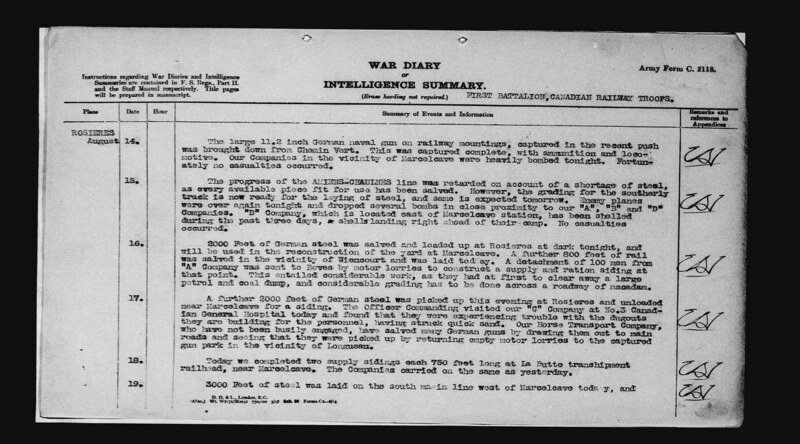 The war diary of the 1st Battalion of the Canadian Railway Troop showing the first entry referencing the move of the battalion headquarters to Pérrone. 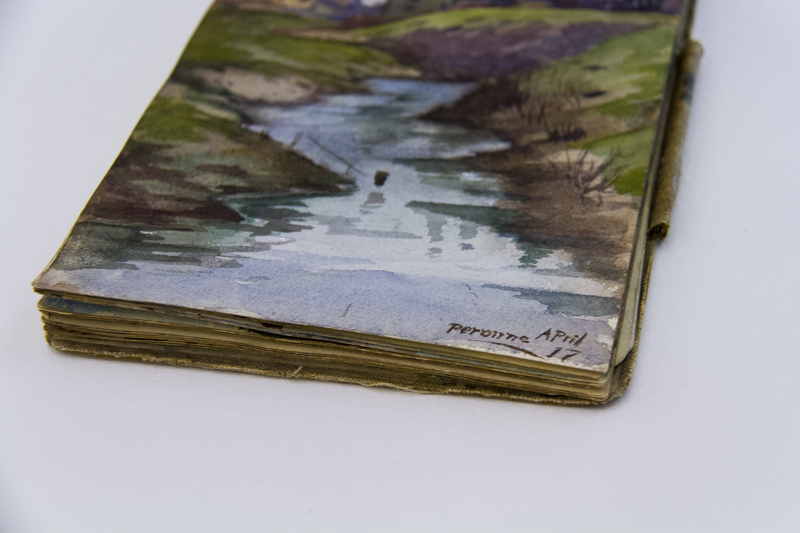 Visit Flickr to view more images of the conservation of books and visual material. 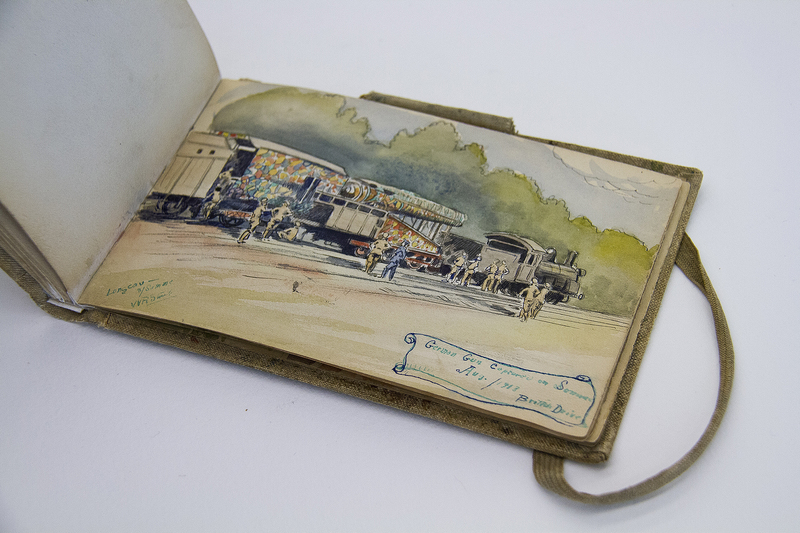 This entry was posted in Our Collection and Facilities and tagged Conservation, conservation Wednesdays, dates, First World War, locations, sketchbooks, William Redver Stark by Library and Archives Canada Blog. Bookmark the permalink.